The Best Tube Bender Review: Only Top on The Market in 2019! The Best Tube Bender That is Required for Metal Forming Process! Metal forming tasks are various and complex. Manual DIY tools that cost about $20 help handy house owners in their everyday repairing chores. Meanwhile, when you look for hydraulic equipment for the industry that is still mobile and portable, the choice is not easy. Professional builders or craftsmen consider their metal forming purposes; the bender’s capacity, flexibility, performance and ease of use. Durability and safety also matter as the equipment’s lifetime is 10 years or more. According to Wikipedia, tube bending is a comprehensive term for various metal forming procedures. Round, rectangular and square tubes are processed, using heat or by cold forming method. 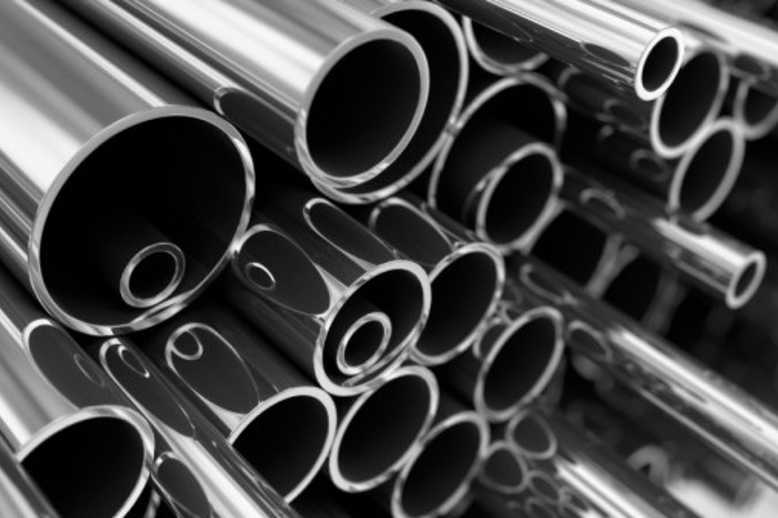 All metals such as steel, aluminum or copper can be processed. Tube-bending procedures are free-form or form-bending; that is press and rotary draw bending. Roll bending can be applied to change the pipe’s bend radius. Cutting is also a kind of tube bending procedure, and various shapes are enabled: flat and square, reinforcing bars and pipes. Therefore, tube bending equipment is various and complicated. We will highlight tools of different types that are still designed for metal forming purposes, being quite affordable for industrial metalworking application, high performance and durability. We will select the best tube bender in any equipment category. Meanwhile, the equipment is to be properly installed, adjusted and used. Instructional manuals and video commercials help metal formers to clear up all daunting issues and start working fast and easily. So, be careful, wear protective gloves and clothing (jackets), metal safety glasses (goggles), helmets, and earplugs. Avoid overheating the equipment and take all the necessary safety precautions. Let your work be safe and efficient as the tools we offer herewith, really enable it to be. 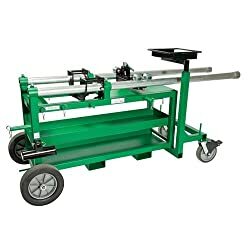 The Hydraulic mobile bending table still has not been heavily reviewed. It is really new and innovative. It is made in the USA by an experienced and reputable family-owned business, protected by a US Patent (No. D667, 469). Therefore, it’s price seems to be excessive, but it’s quite reasonable. The equipment is obviously designed for industrial and commercial applications helping the crew (operators) to do the job fast and easily, to be more productive. It is used by the companies providing remodeling and electrical services to the households. The machine is heavy duty, designed for bending tubes of any diameter at 16-90 degrees. Therefore, the table can be called the best tubing bender for the money. The basic MBT benefits are its mobility and maneuvrability. The crew can move it anywhere they need to, adjust it within a few seconds, bend any metal tubes, including large and solid ones. It fits 36” wide doors, that is the standards size. Swiveling wheels lock securely into place. The table is equipped with fork pockets that make its transport, moving and lifting with a fork truck, easy and simple. The table is rigid and feature-rich. It is constructed with heavy gauge steel and equipped with reliable, rugged rubber wheels that add maneuvrability. The equipment simplifies difficult and complex bending operations, increasing accuracy, reducing bending time. The machine is dedicated for bending rigid conduit and tubes up to 4 in. in diameter that is sufficient for any house remodeling needs. The equipment uses vice-chain for accurate bends. The table is convenient, quick to set up. It is very compact and easy-to-adjust. Bench-high, vertical bending allows perfect control and movement freedom for the operator. The table stores all the necessary components carriage assemblies, that saves crew precious time. It is equipped with a ram positioner that is easy to set. A basket to hold a hydraulic pump is attached. Steel pegs for storing saddles and shoes are available. Storage for the bars is provided, as well. The bending table is a bit expensive, but the price is very good, as the equipment is designed for industrial application. It is useful to increase productivity. So, the investment is quite wise and justified, as it pays its way very soon. As the product is still new, please, read the instructional manual attentively and watch a video review for your information. easy to transport, set up and use. The famous Hitachi Power Tools Company produces multiple professional-grade devices for various applications, including metalwork, concrete, woodwork, cutting, drilling and fastening. This product is their superior innovation. It is designed for easy on-site rebar (reinforcing bars) installation, for professional concrete installers. The tool reduces the installation cost, so this investment is really good. The machine is called the best by affordable bender review as it’s simple, portable and precise. Variable speed trigger is large, ensuring excellent control. VB16Y is easily transportable. It can be used directly on the jobsite, bending and cutting rebar. Portable design promotes maneuverability. Pre-drilled base is suitable for mounting to a work surface. Cutter life is designed for more than 5,000 cuts. Two replaceable cutting anvils are available. Lasting durability is empowered by metal construction and internal gears. 530 W power is sufficient to bend uniformly Grade 60 rebar of 3/8”, 1/2” and 5/8” diameter. The machine is capable of bending 3 rebar pieces at a time. Maximum binding angle is 180 degrees. The cuts are completed in 3.1 second; the bends are performed in 5.1 sec. Precision is guaranteed by safety locks and variable speed trigger. Slow speed operation is possible. The tool is easy-to-use, stable due to two receiver points (for long rebar cutting), in spite of very low profile design. Pre-set dial is turned, enabling bending in any angle. The bending plate comes with reference marking, for easy position adjustment. The bends are pre-set for 180, 90, 45 and 130 degrees for consistency. Custom bends are also possible. One handed dial is easy to use. A bit pricey, but powerful, capacious, portable and simple. Handling instructions and a video commercial are provided for additional information. The cutting saw is feature-rich and powerful. These are the main reasons why multiple customers select it. LC1230 is dedicated for cutting non-ferrous metals, iron and steel. It is suitable for cutting tubing, angle iron, conduit, channel and light pipes. By nature, it’s a circular cold blade that efficiently cuts all kinds of metals, including the ones that are hard to cut. That’s why the tool is recognized as the best budget tubing bender, being safe, easy to use and extremely capacious. The cutting saw is lightweight, portable and easy to use. But the range of cutting angles is not the best and the tool is not adjustable enough. Stability is guaranteed by cast aluminum, large base. Carbide steel blade lasts 50 times longer than popular abrasive wheels. The performance is high due to powerful, 15-amp motor, producing 1300 rpm. The cutting capacity is 3.5” (at 45°) – 4.5” (at 90°). The saw enables 4 times faster cutting than abrasive saws. Accurate, clean, burr-free cutting is enabled that is cost-efficient and impressive. The D shaped, rubber handle in very comfortable designed for easy gripping. It is provided with a lock-off button to prevent accidental starts. Brushes are externally accessible; guide plate is virtually tool-less. Socket range enables convenient and easy blade changes. Collection tray for waste disposal is available. 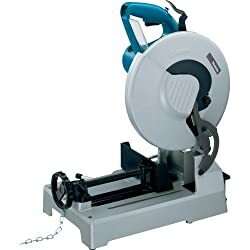 The saw is quite affordable in comparison with the similar tools. Socket wrench safety goggles and a switch are included, as well as carbide-tipped blade. An instructional manual is enclosed for your reference and an online review is available for visibility. The hydraulic rebar cutter that is promoted by Mophorn Company is dedicated for cutting steel bars. It is commonly used for construction, coal mining, highway, bridges and railway renovation, steel production purposes. 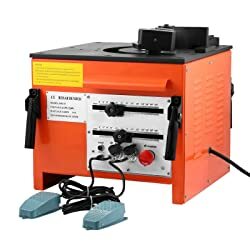 This affordable bender is lightweight, environment friendly and extremely fast. Any cutting angle is possible. The cutter is portable, appropriate for high-altitude operations. The cutter is long-lasting and reliable and it is solid enough to cut hard metal. It does not produce iron debris; thus, iron flows and fire burns on the body are eliminated. The tool cuts off a bar within 5.5 sec. that is extremely fast. Powerful motor is suitable for heavy duty operations. The blades are replaced quickly and easily. The saw is easy to operate and maintain due to fuel port. The tool design is ergonomic, perfect for comfortable operation. It is easy to clean, and that extends the cutter’s life. 3 Allen wrenches, 1 simple wrench, and a hydraulic oil bottle is available in the box. noisy as all tube benders. RB-25 machine is dedicated for bending rebar and steel rods. It is heavy duty, powerful and fast. It is commonly used for construction of various facilities, both residential and industrial ones. That’s why it is recognized as the best tube bender for the buck. So, it’s highly recommended for manufacturers, contactors and builders who want to save their precious working time and efforts, increasing ROI and productivity. The machine is promoted as a portable one, but it’s quite heavy. So, it’s better to keep it on the ground. 0-180 bending angles are enabled that makes the machine suitable for any application and bending work. The bending angle is ensured by the special two point preset angle locks. The conversion speed is controlled by an electrical brake. The machine is appropriate for bending steel bars from 6 to 25 mm in diameter. Various required shaped are empowered. The machine is top-quality, sturdy, reliable and safe. It doesn’t produce smell, sparks, noise or dust and it prolongs the life time. Emergency stop and flush mounted, eay-to-use start buttons are available. The machine is CE and ROHS certified. The motor is really powerful for easy and accurate operation. It is turned on by a foot pedal, ensuring hands-free operation. The bender is simple to use. The bender comprises small and big gears, a speed reducer, curved surface that ensure accurate and stable operation. Collars and rollers of various size and available, facilitating bending of different diameter rebar. The motor use is reverse. The machine eliminates worker fatigue and injuries caused by manual tools. The price seems to be a bit excessive, but it’s very good for such a heavy duty, performant and reliable machine. 2 foot pedals are included. Please, watch a video that highlights the machine’s benefits. Thus, tube benders are various and diversified. Most of them are designed for rebar cutting, ferrous and non-ferrous metalworking, small and large diameter tubes bending. Manual tools are the cheapest. They are suitable for household applications. Hydraulic and electric benders are the best for contractors, manufacturers and builders. 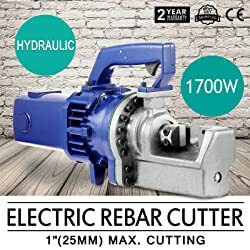 Rebar cutters are more affordable than benders. They are commonly designed for concrete installers, facilitating various facilities construction or renovation. Meanwhile, the devices we highlight in this review are portable, mobile, safe and easy-to-use. They save a lot of working time, paying its way within the nearest years. So, the best tube bender is a good investment, essential for most of renovation companies and contractors. And, please, don’t forget about the safety measures. Wear safety goggles, gloves, helmets and jackets. Be extremely careful during metal working. And let your professional work be efficient and safe with a reliable and easy-to-use tube bender. Which Bag Should Plumbers Buy?